Hard braking and hairpin turns won’t tip the High Road TrashStand car trash bin. A built-in bottom weight and floorboard grip strips keeps it in place, so you can step on the gas without worrying about toppling car trash. And its fully leakproof liner will keep spills and stains off car carpet and upholstery. Compact size, easily fits in small and larger vehicles. 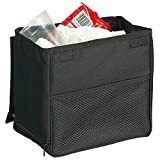 A fully leakproof and weighted car litter basket with side pocket storage that holds 2 gallons worth of trash and won’t tip, even on the tightest turns.